Ford Motor Co. is sponsoring the 10th-generation Deep Orange vehicle prototype, which will be conceived and designed by automotive engineering master’s students at the Clemson University International Center for Automotive Research. The Deep Orange project at CU-ICAR provides students an opportunity to work directly with automotive industry partners to create a prototype vehicle in two years. For this iteration of Deep Orange, students will develop an electric autonomous mobility concept vehicle for 2030 smart city life. 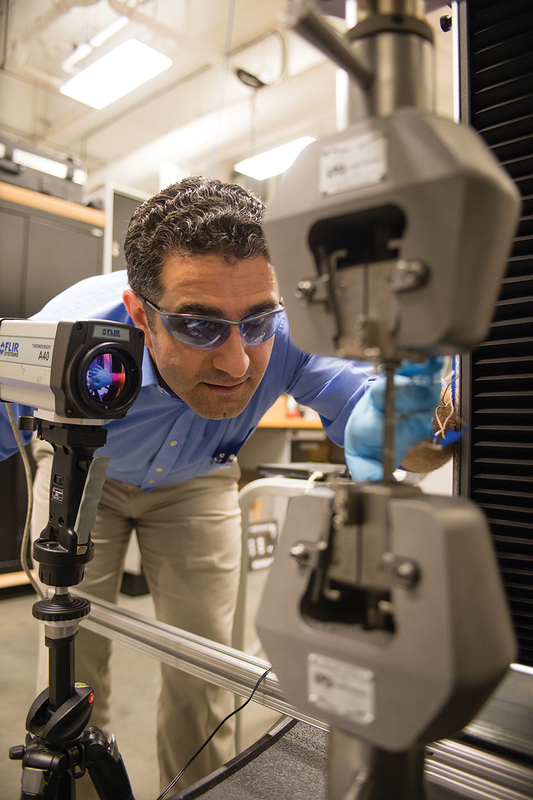 Luiz Jacobsohn is working to find the most effective material for use in radiation scintillators, which will lead to a reduction in the radiation dose in medical treatments. How can we keep food fresh with less energy during cold storage and transportation? What’s the best way to manage water supplies during extreme drought? How can we get personalized medications to patients faster? 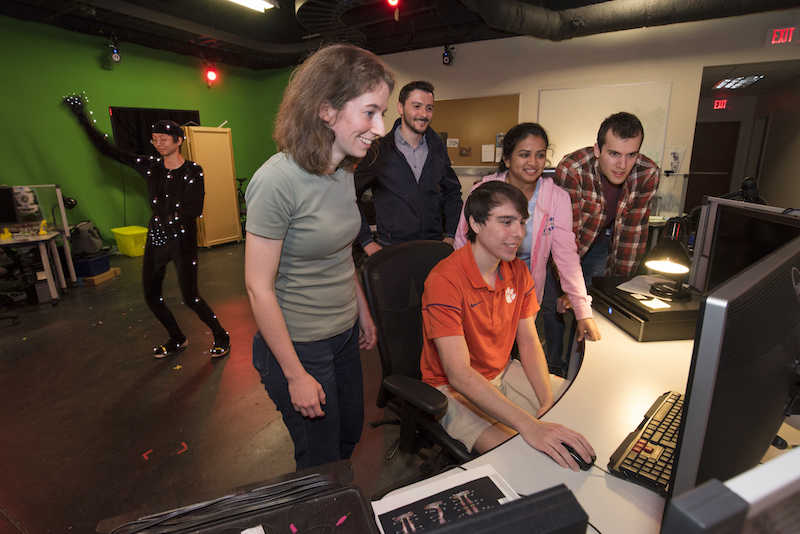 Seven Clemson researchers will tackle these questions, and others, thanks to competitive awards from the National Science Foundation’s Faculty Early Career Development Program totaling more than $2.7 million. CAREER awards are investments in some of the country’s most promising young researchers, providing a boost to their careers and to the quest for answers. Clemson has experienced increasing success in winning CAREER awards. There currently are 31 active projects funded by CAREER awards; 30 University faculty members have received awards since 2010, including seven each in 2016 and 2017. Luiz Jacobsohn (pictured above), assistant professor of materials science and engineering. 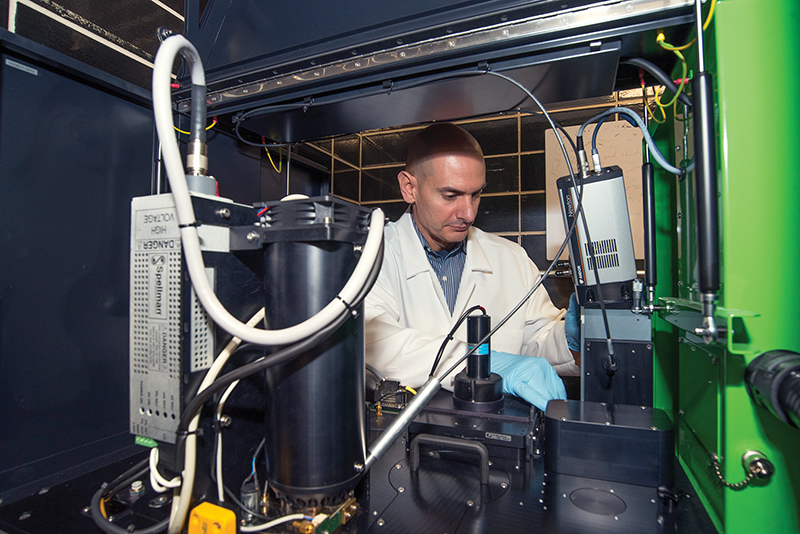 Jacobsohn’s quest is for the most effective material for use in radiation scintillators, which detect radiation in a number of applications, from medical imaging to national security. Sophie Jörg, assistant professor of digital production arts. Jörg works to make the virtual world more realistic. With the NSF grant, she will develop and refine the complex and subtle movements of hands and fingers. 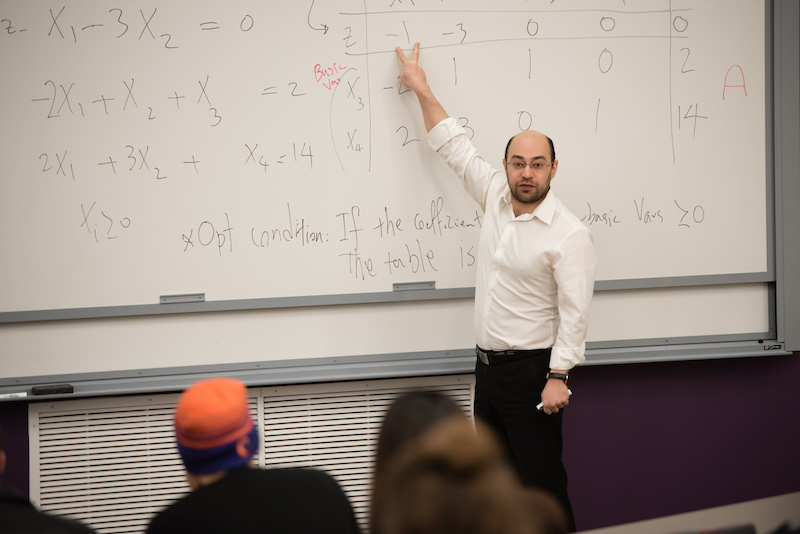 Amin Khademi, assistant professor of industrial engineering. Khademi is tackling the complex and complicated process of bringing pharmaceuticals and other products to market and to patients, by developing new mathematical methods for carrying out clinical trials. Ashok Mishra, assistant professor of civil engineering. 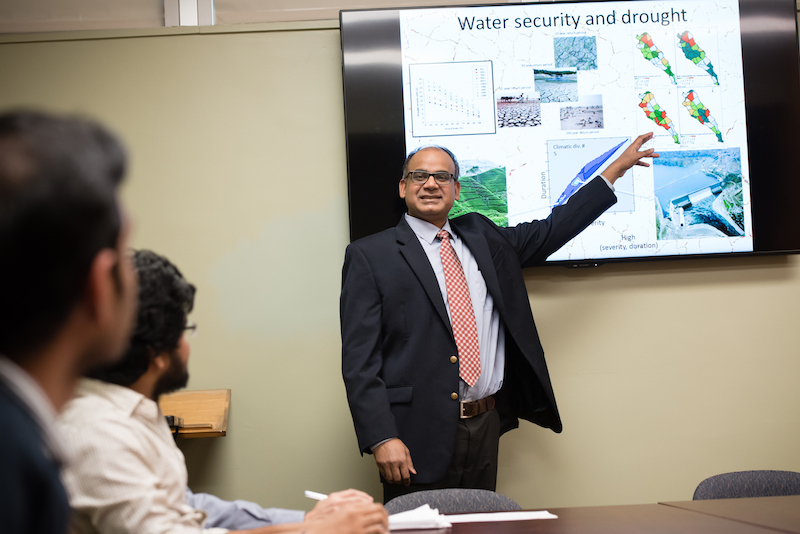 As a water resource engineer, Mishra is creating mathematical models to characterize extreme drought events that can improve water security in a changing environment. 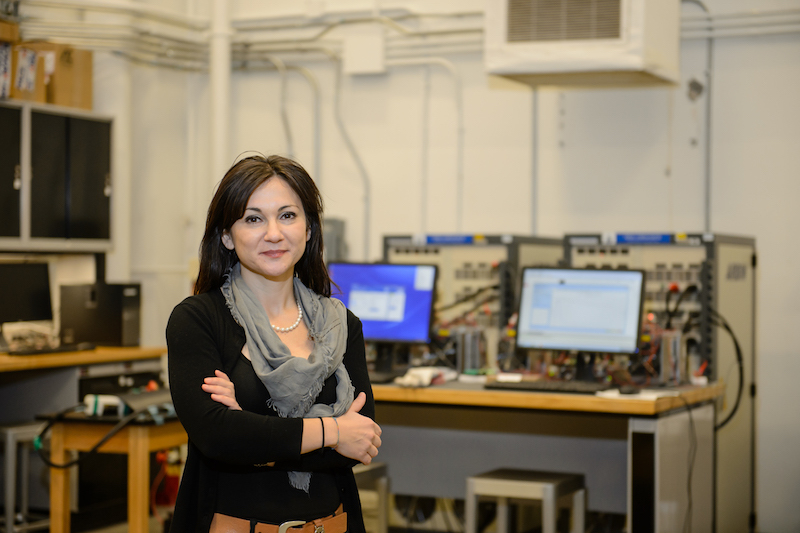 Simona Onori, assistant professor of automotive engineering. Onori, a control engineer, is helping make the world a cleaner place. Her research involves multiscale modeling to develop advanced controls that will mitigate emissions in new-generation vehicles. Marissa Shuffler, assistant professor of industrial and organizational psychology. Porter received a rare award for behavioral research. Her work focuses on improving the ways teamwork and leadership are taught in organizations. 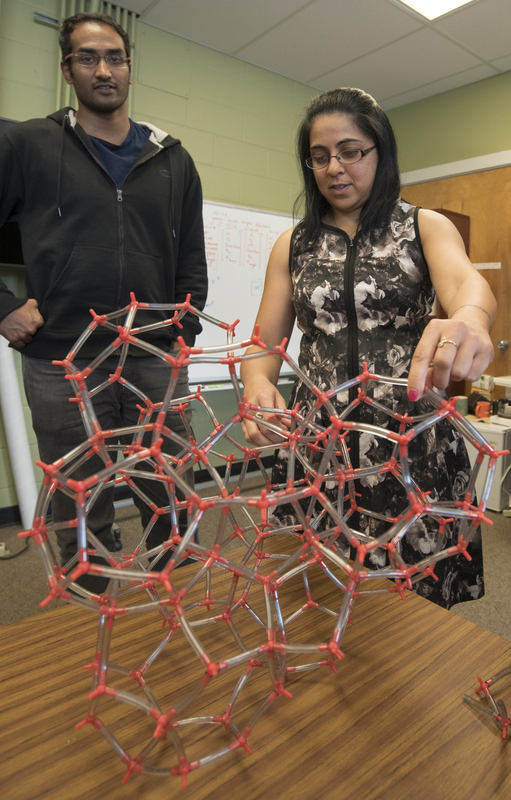 Sapna Sarupria, assistant professor of chemical and biomolecular engineering. Sarupria is designing new materials for keeping things on ice. She’s using high-throughput screening to efficiently discover new materials that either inhibit or promote ice formation. Robert Prucka was still too young to legally drive a car by himself but not too young to work on engines when one of his favorite NASCAR drivers, Alan Kulwicki, died in a plane crash. Now Prucka is taking on a new position at Clemson named for his fallen childhood hero. Prucka, an automotive engineer whose passion for engines is alive as ever, is the new Kulwicki Endowed Professor in Motor Sports Engineering. His first big project will be guiding a team of graduate students and industry sponsors in building a next-generation Rallycross race car at the Clemson University International Center for Automotive Engineering in Greenville. Kulwicki received a bachelor of science in mechanical engineering from the University of Wisconsin-Milwaukee and applied what he learned to make his car go faster. When Kulwicki won the 1992 Winston Cup Championship, Prucka was a teenager growing up in Monroe, a small town amidst the cornfields south of Detroit. He was a NASCAR fan and the kind of kid who loved working on engines, whether they powered cars, chainsaws or lawnmowers. “Alan Kulwicki was an engineer, and he owned and drove his own car,” Prucka said. “He used his engineering knowledge to make his small team more successful. In the 1990s, it was rare.” Kulwicki and three others died on April 1, 1993, when a small plane crashed near Blountville, Tennessee. The plane had just left Knoxville, where Kulwicki had been signing autographs at a Hooters restaurant as part of his new sponsorship deal. Among those killed was Mark Brooks ’91, the 26-year-old son of former Hooters restaurants chairman Robert H. Brooks. The elder Brooks, a Clemson alumnus, later provided the funds that allowed the University to establish the Brooks Center for the Performing Arts, the Kulwicki Endowed Professorship and what is now called the Robert H. Brooks Sports Science Institute. He died at age 69 in 2006. Prucka is now focusing much of his attention on Deep Orange 9. The ninth installment of the much-celebrated program will be the first aimed at motorsports. Rallycross cars are modified, high-horsepower road cars that compete in sprint races on dirt and paved tracks. But the new Deep Orange car will be about more than racing. Students will also try to make the car safer and more fuel efficient while reducing emissions. “I love it,” Prucka said. “Deep Orange is a shining star, an example of the right way to educate students for industry. Cars are not four wheels and a steering wheel. They are a mobile electronics platform with advanced powertrains and miles of wire. Students will also use sensors to track drivers’ eyes and reaction times. The information combined with artificial intelligence could help search for signs of concussion, a problem now largely self-diagnosed in racing. Kulwicki died at age 38, but his legacy lives on in the way engineers have revolutionized NASCAR. “Today there’s an engineer on every pit box and at least two or three more back at the shop,” Prucka said. “It all started from him. 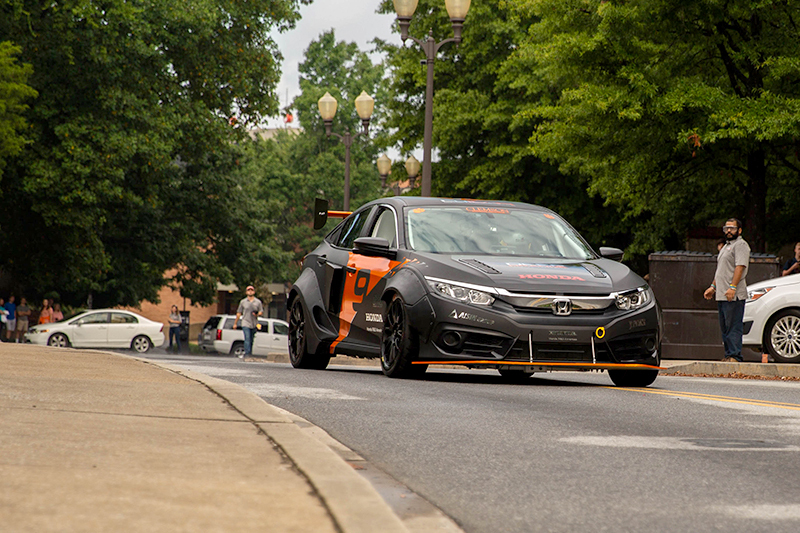 It’s an essential part of being successful in motorsports.” Prucka, a member of the automotive engineering faculty since 2008, has long been central to the Brooks legacy at Clemson. He continues to be active in the Robert H. Brooks Sports Science Institute. 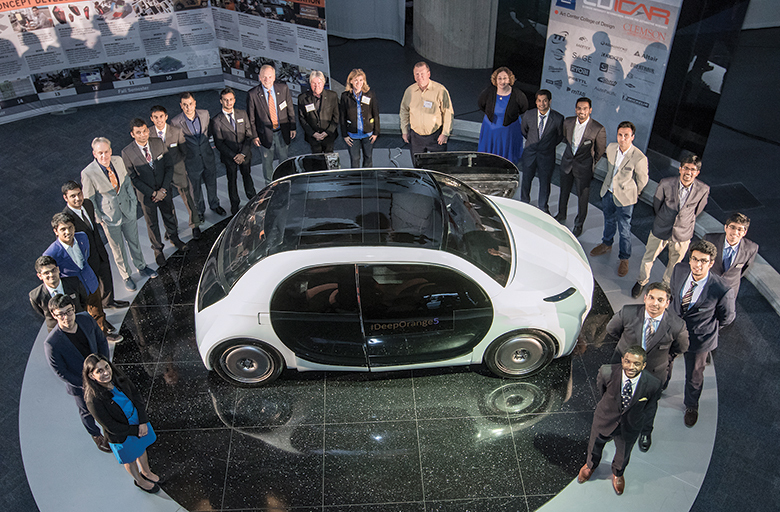 Students at the Clemson University International Center for Automotive Research (CU-ICAR) unveiled its newest concept vehicle, sponsored by General Motors, at the GM Renaissance Center in Detroit. Deep Orange 5, the fifth generation of Clemson’s concept vehicle program, is designed for young adults who will live in mega cities in 2020. The vehicle was designed by Art Center College of Design students and engineered by Clemson automotive engineering graduate students. Features of the car include a reconfigurable seating concept, double-hinged doors, a two-piece rear hatch concept and a color display on the outside of the front doors for digital message display. It’s the most sought-after recognition an emerging science, engineering or mathematics faculty member can receive: a National Science Foundation Faculty Early Career Development (CAREER) grant. And this year, Clemson faculty claimed five. A CAREER grant is the NSF’s most prestigious award in support of early career development activities, providing a financial stipend to support research activity for five years. The NSF, an independent federal agency, supports fundamental research and education across all fields of science and engineering. As any professor who has applied for a CAREER grant can attest, a submission for this award is much more than a research proposal: It’s a career development plan. The goal is to fund faculty members early in their careers to promote their development into teacher-scholars. The scientists and researchers who receive the awards are widely considered the most likely to become the academic leaders of the 21st century. Each year, NSF receives about 50,000 competitive requests for funding and makes about 11,500 new funding awards. Since 2005, Clemson has been home to more than 30 CAREER grant recipients. Whether you’re digging for family history or just browsing for fun, thumbing through decades-old Clemson yearbooks is an intriguing experience. And now that experience is accessible to anyone with a computer and an Internet connection. Clemson’s Special Collections Library has digitized the complete run, from the first volume (Clemson College Chronicle) in 1899 through 2012. The yearbook had several names before finally becoming Taps in 1908. 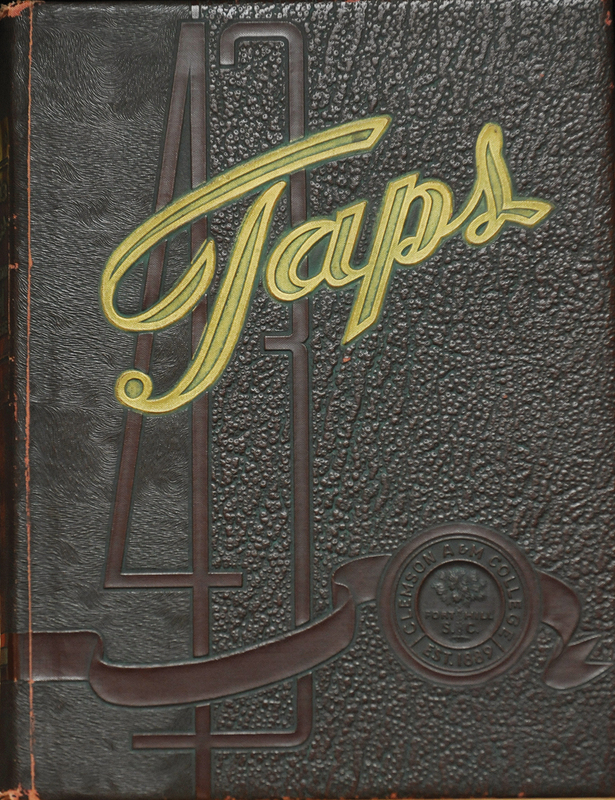 Clemson’s Special Collections Library has digitized TAPS. Through a partnership with the Internet Archive, the yearbooks were scanned cover-to-cover in full color. Online visitors can page through a volume, download a PDF, view it on a Kindle or search the full text. This project was made possible through the LYRASIS Digitization Collaborative — a Sloan Foundation grant-subsidized program that has made digitization easy and affordable for libraries and cultural institutions across the country. Also available digitally are the Clemson Catalog (undergraduate announcements) and the Clemson Chronicle (the student literary/arts/photography journal). In the coming months additional publications will be made available: Clemson College Newsletter (faculty/staff), The Agrarian (School of Agriculture student publication), and Bobbin & Beaker (official journal of the Textile School). When all these publications have been digitized, more than 100,000 pages of full-color, text-searchable Clemson-related materials will be available for researchers worldwide. 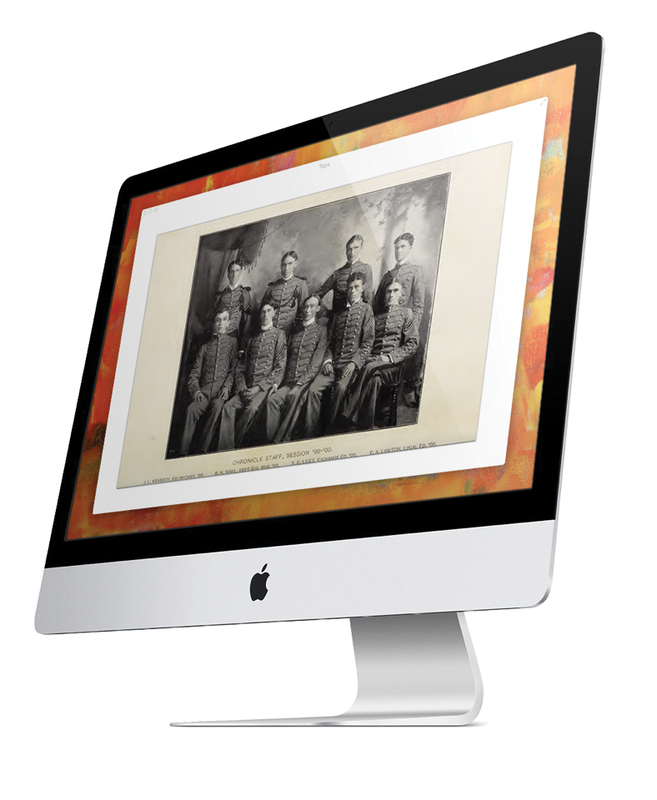 To view the yearbooks, visit http://library.clemson.edu/depts/specialcollections/clemson-yearbooks/. 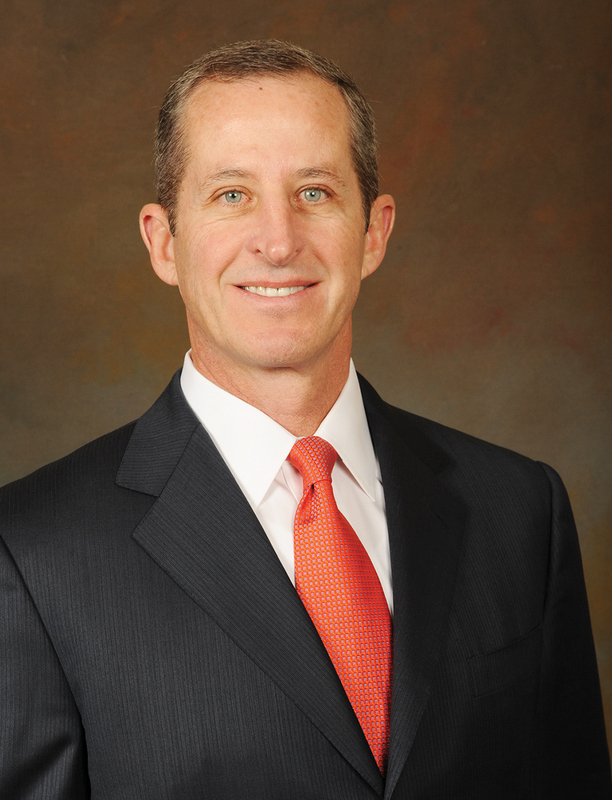 Charlotte business leader Mark Richardson ’83 is the newest member of the University’s board of trustees. Manager and owner of MAR Real Estate LLC, a commercial real estate company, Richardson is co-owner of the Carolina Panthers, Charlotte Thunder Road Marathon and more than 50 Bojangles’ restaurants in North Carolina and Virginia. He played on Clemson’s 1981 national championship football team. “Mark brings to the board keen business and marketing insights, a commitment to excellence and a passion for Clemson University,” said Board Chair David Wilkins. Richardson succeeds the late Bill L. Amick of Batesburg, who retired after serving for 30 years. Amick, a 1966 Clemson graduate, was chief executive officer of the Amick Company and a real estate developer. He served as chair of Clemson’s board from 1991 to 1995 and was awarded Clemson’s Distinguished Service Award. Big Yellow Mountain in the Roan Highlands. Students from Patrick McMillan’s plant taxonomy class explored some of the most ecologically diverse areas in the Southern Appalachian Mountains, thanks to alumnus Witt Langstaff. 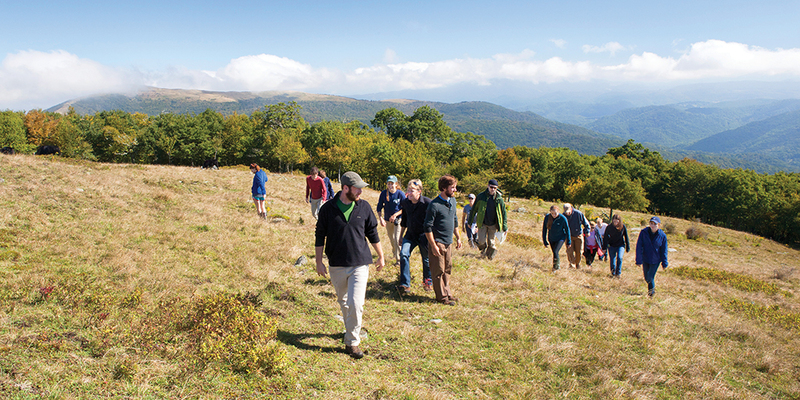 Langstaff has property on Big Yellow Mountain, located in the Roan Highlands along the North Carolina/Tennessee state line, and hosts McMillan’s class each fall. One of the highest elevation areas in the Eastern U.S., the Roan Highlands has plant communities and climate typical of New England and Canada and is the location of one of the most picturesque and unique natural communities, the grassy bald. 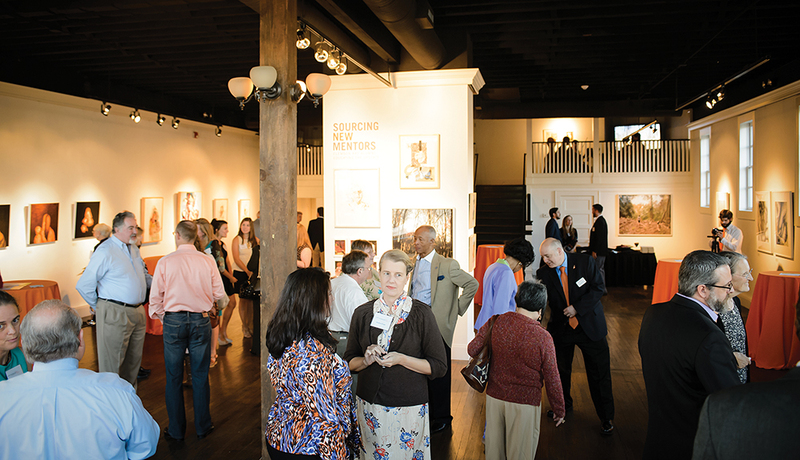 Clemson’s Center for Visual Arts opens at West Greenville [/caption]Once the heart of the local textile industry, West Greenville has reinvented itself as an art destination. The Village of West Greenville is home to more than 30 artisans — including potters, sculptors, photographers and painters — as well as local businesses and restaurants. And now Clemson’s Center for Visual Arts has opened its doors there as well. The Center for Visual Arts serves as the umbrella for all visual art activities at the University. The location on Pendleton Street will allow for undergraduate and graduate students, faculty and alumni to have hands-on experiences in developing, curating, installing and exhibiting art. The center will engage local, regional, national and international artists and will give Upstate residents an opportunity to both see and “do” art. 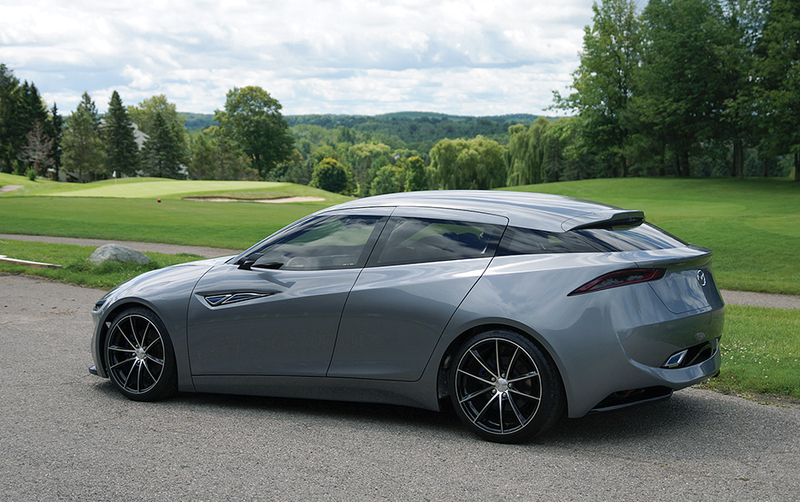 Students in Clemson’s graduate automotive engineering program displayed a new concept vehicle at the 2013 L.A. Auto Show in November. Deep Orange 3 features a unique hybrid powertrain that automatically chooses front-, rear- or all-wheel drive; a load-bearing structure based on innovative sheet-folding technology patented by Industrial Origami; and groundbreaking 3+3 seating configuration in sports-car architecture. Clemson’s graduate automotive engineering students are required to create and manufacture a new vehicle prototype. The vehicle’s concept and design are developed in partnership with students from the transportation design department at the Arts Center College of Design (Calif.) focusing holistically on the vehicle and the end-user. Each year, a prototype vehicle is developed with a new market focus and technical objectives, providing students an opportunity to work directly with automotive industry partners to innovate and develop ideas. 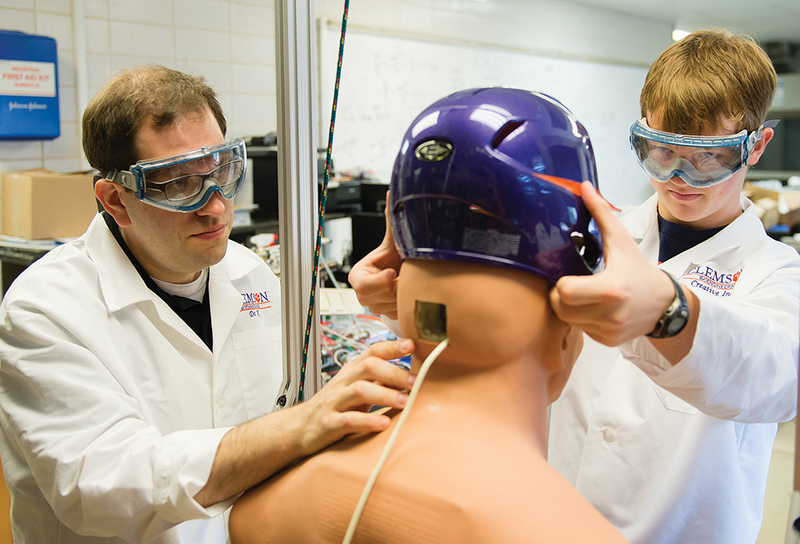 Assistant professor of bioengineering David Kwartowitz works with a student Creative Inquiry team conducting research to prevent sports concussions. Hardly a week goes by without a news story about the effects of concussions on athletes from pee-wee to professional. And Clemson researchers and students are tackling the issue. An undergraduate Creative Inquiry student research team, working with bioengineering professors David Kwartowitz, John DesJardins and Delphine Dean, has designed a dummy equipped with brain sensors that provide concussion data. The students built a track system to strike the head of the dummy with numerous objects, including weights, footballs, baseballs and helmets. Using this system, the researchers can manipulate the impact of these objects and the sensors provide instant concussion results. “We control impact and collect concussion data while the dummy is donning an NCAA-approved football or baseball helmet,” says Kwartowitz. While the project is educational for the Creative Inquiry student team, it’s designed to be educational for elementary, middle and high school students as well on the severity of concussions and the benefits of wearing protective equipment. The dummy simulator eventually will be displayed in Greenville at the Roper Mountain Science Center’s newly renovated health research facility, where 120,000 students visit annually. One of South Carolina’s longest established private foundations has underscored its commitment to medical science by funding an endowed chair in genetics research at the Clemson University Center for Human Genetics. The Self Family Endowed Chair in Human Genetics will advance the development of novel therapeutics treating genetic disorders at the cell level. The $4 million chair is jointly funded by the Self Family Foundation and the state of South Carolina. The researcher, to be selected, will be a leading geneticist who will work toward treatment, and preventive, diagnostic and curative tools with life-changing and economic potential. The endowed chair will allow Clemson to build on the Greenwood Genetic Center’s potential for seamless technology transfer through opportunities for industry partners to locate in the adjoining Greenwood Research Park to support local business and economies. According to Frank Wideman, president of the Self Family Foundation, the foundation made this commitment to honor the late Jim Self who understood early on the enormous potential of research to treat and cure genetic disorders. It was his vision to transform Greenwood from a traditional textile town to a modern center for the life sciences. Self was a longtime chair of the Self Family Foundation, a life trustee of the University and a founding investor in the Greenwood Genetic Center. Clemson wildlife biology students made a strong showing at the 2013 Wildlife Society Annual Conference in Milwaukee, including first place in the student research in progress poster category and second place for the best doctoral research poster presentation. 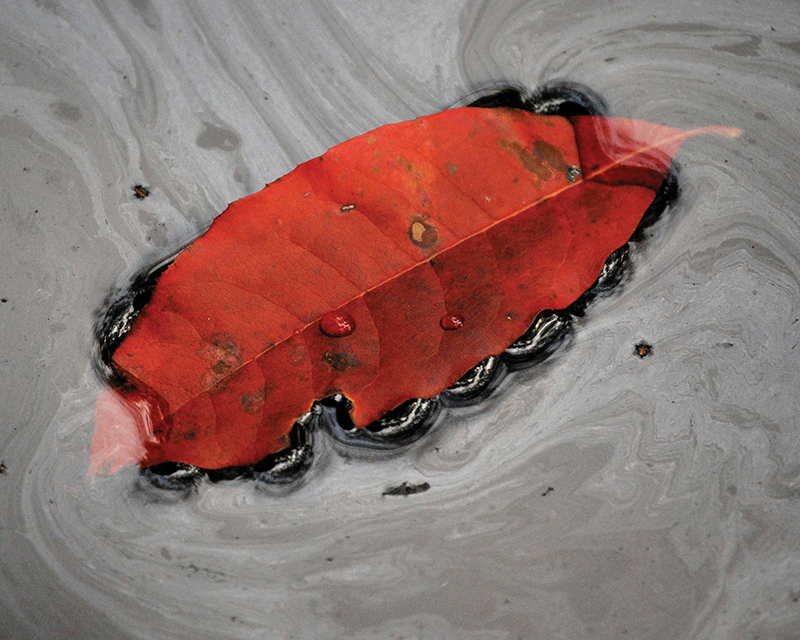 Senior wildlife and fisheries biology major Jenna Kohles won first prize in flora photography for this photograph of a sourwood leaf floating on a pond in her hometown of Cary, N.C.
Georgia Tech professor Nihad Farooq (left) and Clemson professor Kimberly Manganelli confer before the final Road Scholar Series lecture. Georgia Tech professor Nihad Farooq (left) and Clemson professor Kimberly Manganelli confer before the final Road Scholar Series lecture. [/caption]The fifth and final Clemson Humanities Road Scholar Series lecture, “Slavery and Social Networks in the New World,” took place Friday, November 15, in connection with the Georgia Tech vs. Clemson football game the night before. 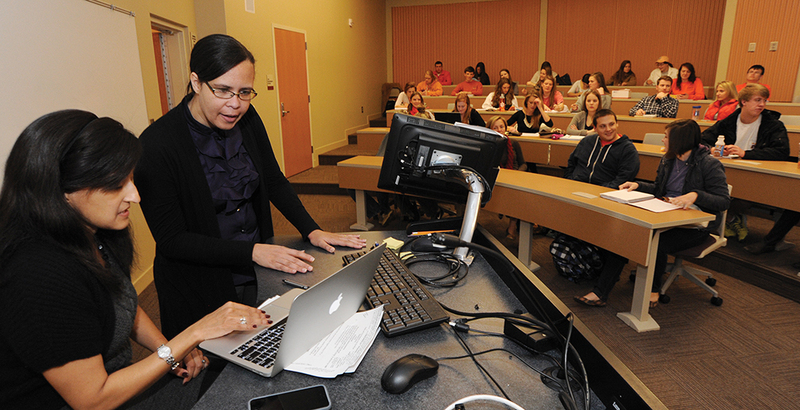 The series paired the Tigers’ associate professor of English Kimberly Manganelli (above, right) with Yellow Jackets’ assistant professor of American studies Nihad M. Farooq in a lively discussion of slavery and race. Jonathan Beecher Field, associate professor of English at Clemson, organized the series which brought humanities professors from visiting football opponents to Clemson throughout the fall to present their current research, each followed by a response from a Clemson professor. Faculty from the University of Georgia, Wake Forest University, Boston College, Florida State University and Georgia Tech accepted Clemson’s invitation to visit and engage with Clemson faculty and students. The series received support from across campus, including the Humanities Advancement Board, the Pearce Center for Professional Communication, the Department of Athletics, the College of Architecture, Arts and Humanities, the Class of ’56 Academic Success Center, the Office of the President and the Office of the Dean of Undergraduate Studies. In her response, Manganelli explored the networks of slavery, both global and local, and together the scholars engaged their audience in a brief Q&A period. SCE&G Energy Innovation Center at CURI. U.S. Deputy Secretary of Energy Daniel Poneman spoke at the November dedication of the world’s most advanced energy systems testing and research center, located at the old Charleston Naval Base. “Developing America’s vast renewable energy resources is an important part of the Energy Department’s ‘all-of-the-above’ strategy to pave the way to a cleaner, more sustainable energy future,” he said. 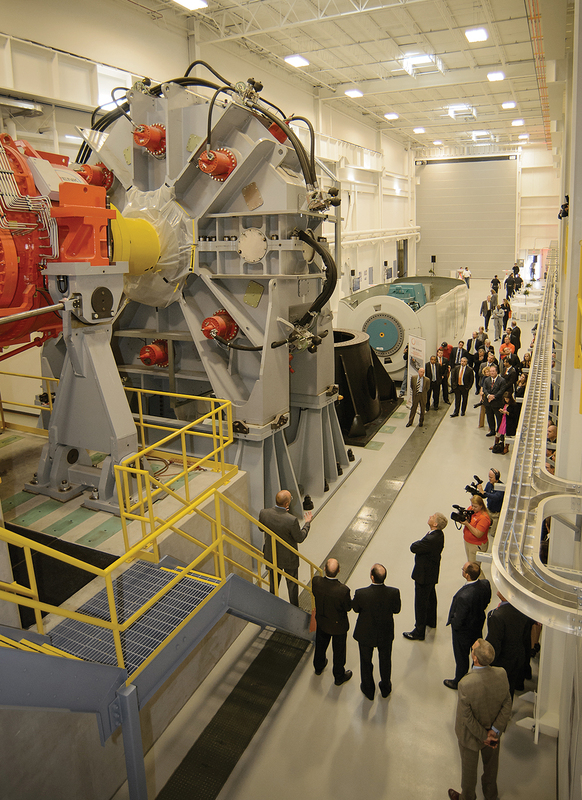 The SCE&G Energy Innovation Center, which is part of Clemson’s Restoration Institute, houses a four-story, 400-ton unit capable of testing drivetrains for wind turbines that can produce up to 15 megawatts, which is enough energy to power 6,000 homes. There are only two other such facilities in the world, but neither has this large of a capability. In addition to drivetrain testing, the facility also includes the Duke Energy eGRID, which can simulate the electrical grid of any country in the world, allowing companies to see how solar, wind and storage devices might interact with the grid. U.S. 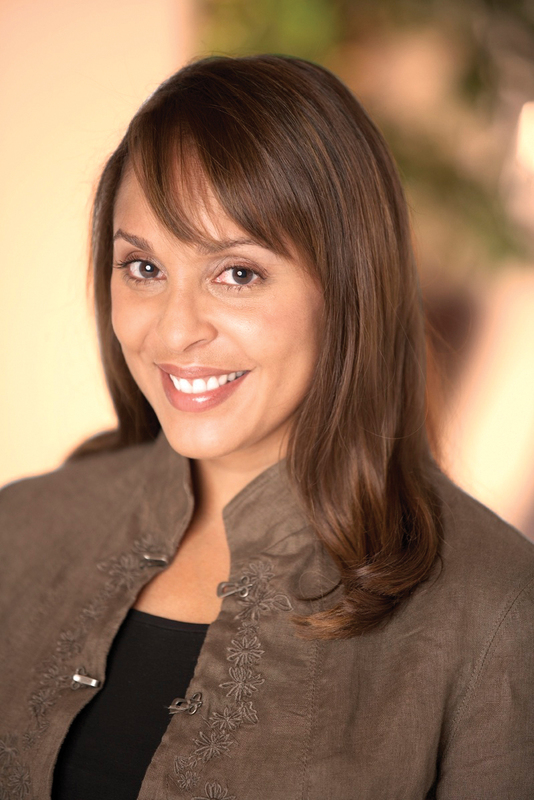 Poet Laureate Natasha Trethewey. Pulitzer Prize-winner and U.S. Poet Laureate Natasha Trethewey, along with a dozen other authors from around the country, will be on campus this spring for the seventh annual Literary Festival. The festival, one of the few in the country planned and run by students, will include a Young Writer’s Workshop on Friday and Family Day on Saturday. The Young Writers Workshop is a half-day event for area high school creative writers. Upstate teachers bring selected students to campus for a day of readings and workshops with authors including Kelly Link (Pretty Monsters), Benjamin Percy (Red Moon) and poet Mathias Svalina. The Humanities Advancement Board is funding an expansion of the workshop this year, and the organizers are expecting approximately 70 students to attend. At the heart of this event is a Creative Inquiry class, taught this year by professor Keith Morris. His class of 11 undergraduates and one graduate student are divided into four groups that handle communications, design, planning and organization. Each student serves as a liaison for one of the authors, handling correspondence, introducing the author at the festival and then writing a critical essay on the author’s work. Many of the students, according to Morris, have used their experience on the festival as a way to secure jobs and internships. For a schedule and more information about this year’s festival, go to clemson.edu/litfest. If you go to the website for Clemson’s Machining & Technical Services, you can read about the many capabilities of this department in the College of Engineering and Science. Seven bullet points list everything from drafting and machining to plastic fabrication and welding. That’s what director of instructional and research support Phil Landreth ’84 will tell you, backed up by his staff of engineers, artisans and craftsmen who work in the basement of Freeman Hall, packed with high-powered equipment and projects. “It’s like walking into Monster Garage every morning,” Landreth says with a grin, referring to the Discovery Channel show. There are no chrome dashboards or classic interiors, but the challenges they meet each day and the solutions they create have life-changing implications. The list goes on and on — from turf cutter blade parts for athletics to a machine to make miniature bales of cotton for materials science and engineering and air handling shafts for Facilities Maintenance and Operations. They produce samples for undergraduate labs to use for stress testing. They’ve helped students develop easy-to-connect joints for the steel bridge competition. They’ve created a mechanism to dynamically compress artificial cartilage tissue as it is being grown. They even worked with emeritus professor Cecil Huey to replace the governor on a historic steam engine for the Conservation Trust of Puerto Rico. When art professor Sydney Cross wanted an etching press larger than she could find commercially, she went to the guys in Machining & Technical Services. The outcome? An etching press with a 5’x8′ bed. “It is the largest etching press at a university on the East Coast,” says Cross, “and I don’t know of anyone commercially producing them at that size.” Her classes use the press on a regular basis. Pictured here is Claudia Dishon ’10, who completed her Master of Fine Arts degree in printmaking. The MTS shop produces a number of parts for the formula car teams that Clemson fields. Pictured here is the front hub being machined for the 2012 SAE formula car. The MTS shop created parts for a heart valve bioreactor that was developed in Dan Simionescu’s Laboratory for Regenerative Medicine at the Clemson University Biomedical Engineering Innovation Campus (CUBEInC). CUBEInC, which opened in December 2011, is part of Greenville Hospital System’s Patewood campus. Faculty at CUBEInC collaborate with cardiovascular and orthopedic surgeons across the hospital system and expose their students to the highest levels of research. 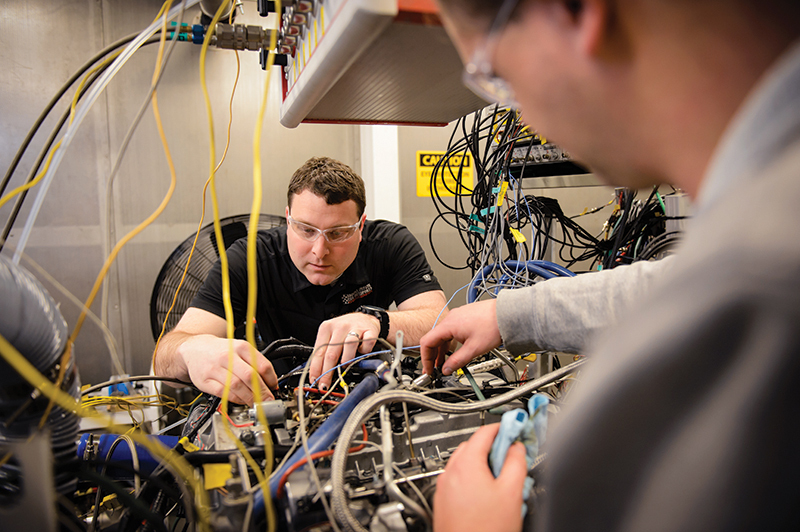 In undergraduate engineering labs, students perform stress tests to determine how various materials respond and to see the relative strength of different metals. MTS produces samples like the ones pictured here. When chemistry professor Ya-Ping Sun needed to create a mechanism to produce fullerene nanoparticles, he came to MTS. They worked with him and others in chemistry, physics and COMSET (Center for Optical Materials Science and Engineering Technologies) to create this mechanism that produces carbon molecules used in pharmaceuticals, lubricants, coatings and composite materials. When civil engineers were developing hurricane-proof building techniques, they worked with MTS to create joist hangers and hurricane clips that were then tested in the Wind Load Test Facility. Pictured here is one of the hurricane clips developed to keep roofs from lifting off houses during storms. On the walls of the shop you’ll see pictures of years and years of formula cars designed, built and raced by Clemson students for the annual Society of Automotive Engineers competition. The silent partners in the projects are the guys in MTS. The competition is early May. Like other projects, these might start with a drawing on a napkin, but Landreth and the others pride themselves on the ability to work with students and faculty to figure out solutions, then make those solutions a reality. “We meet with the students and talk about what they want and need,” says Nicholson. The back-and-forth conversation elicits a much better product than just dropping off an order and picking it up when it’s finished. “I can count on one hand the failures we have had of not being able to give someone what they need,” says Landreth. Across campus in another little-known building are two guys spending their Friday morning working on Clemson’s SAE formula car for the competition that is less than three weeks away. The frame is welded together and sits on a large worktable. The whiteboard on the door lists most of the tasks that need to be finished, with a countdown of days to go before competition (19 at this time). “There are more things we need to do, but I’m afraid if I put everything up there, it will overwhelm some of the team,” says Kevin Carlson, one of the team leaders. He and team member TJ Theodore will be here most of the weekend. The SAE formula team is made up of students from mechanical engineering, industrial engineering and business who average 10-15 hours a week beginning in the summer. No course credit, no compensation. The seniors on the team will even have to choose between attending the competition or walking at graduation. Some of the team members (including the other team leader, Perry Ellwood) are working co-op jobs and come back to Clemson to spend their weekends on the car. Two alumni team members return once or twice a week to help as well. The team relies heavily on the guys from MTS, who have produced 14 parts for this year’s car. “We have 125 hours of MTS time,” says Carlson. “We completely design the car in SolidWorks [software application] and then go to MTS with drawings. They do the steering gears, the wheel hubs, the trigger wheels, the throttle body.” The team mills some parts themselves by hand. And they wrangle others, both donated and sold, from outside vendors. The crew in MTS are probably best known for their work with the SAE formula car, but there’s not a college or department on campus that has not been affected by their work. 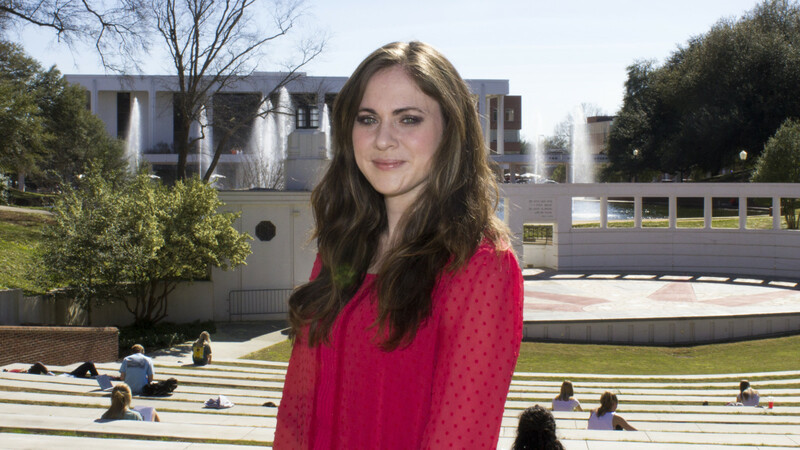 Bioengineer Karen Burg discovered their capabilities while she was still a graduate student. Now a prolific researcher and holder of an endowed chair in bioengineering, she shares some of the credit with them for Clemson research productivity. The rest of the Clemson crew agrees. In addition to Phil Landreth and the four managers, the staff of Machining & Technical Services includes (L–R) David Kelley, Glen Rankin, Scott Kaufman, Brittney McCall, Bill Simmons, Dustin Gravley (kneeling), Dock Houston and Wendy Baldwin.